The Annals of Regional Science presents high-quality research in the interdisciplinary field of regional and urban studies. 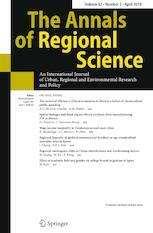 The journal publishes papers which make a new or substantial contribution to the body of knowledge in which the spatial dimension plays a fundamental role, including regional economics, resource management, location theory, urban and regional planning, transportation and communication, population distribution and environmental quality. The Annals of Regional Science is the official journal of the Western Regional Science Association.